Central Penn College announced today that it has earned the 2018–2019 Military Friendly® School designation. This is the fourth straight year that the college has been recognized. The president's cabinet (above) all flashed a thumb's up in the Green Room with speaker Tracey Jones. 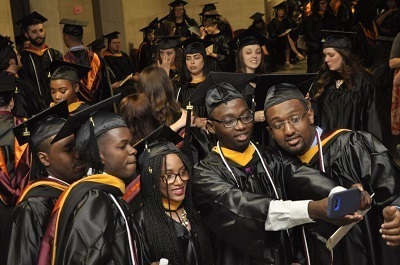 Meanwhile, students took plenty of selfies while they waited to be called. Institutions earning the Military Friendly School designation were evaluated using both public data sources and responses from a proprietary survey. For the first time, student survey data was taken into consideration for the designation. More than 1,400 schools participated in the 2018–2019 survey with 941 earning the designation. “Our flexible course offerings––including online and blended classes––enable our military-involved students to complete their coursework, even if they are assigned or deployed outside of the Central Penn area,” said Dan Guerrisi, the college’s military benefits coordinator. Methodology, criteria, and weightings for the designation were determined by Victory Media with input from the Military Friendly Advisory Council of independent leaders in the higher education and military recruitment community. Final ratings were determined by combining the institution’s survey scores with the assessment of the institution’s ability to meet thresholds for student retention, graduation, job placement, loan repayment, persistence (degree advancement or transfer) and loan default rates for all students and, specifically, for student veterans. The 2018- 2019 Military Friendly Schools list will be published in the May issue of G.I. Jobs magazine and can be found at www.militaryfriendly.com. For more information about Central Penn College programs for veterans and military personnel, visit www.centralpenn.edu/military.